A few posts back, I wrote about the multitude of features and settings that can be customized in Premiere and saved as presets. But what about the very core project file itself? 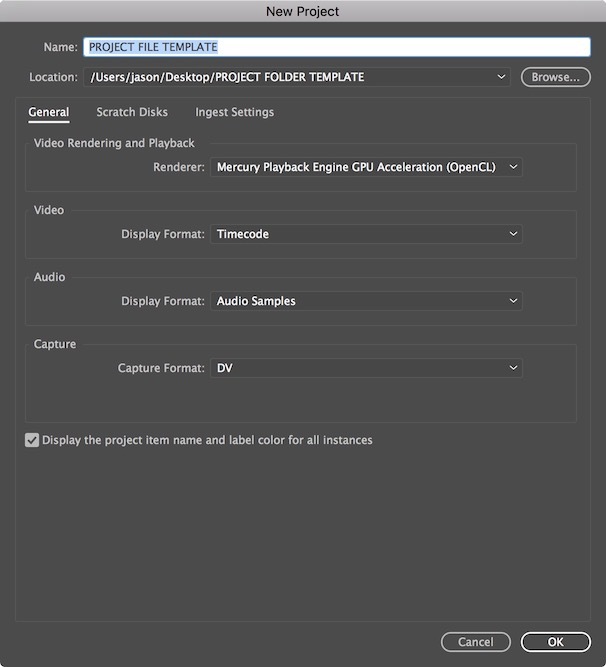 While Premiere has no official method for creating a project file template, it’s far from impossible to have a project file that’s immediately set up just the way you like it, sequence settings and all, with a simple double click! Let’s first walk through building your perfect project file from scratch, thinking about the most important settings and then cover how to template it at the end. First thing’s first, open Premiere and click New Project! Let’s get the obvious out of the way. Name the project file something broad and obvious like “PROJECT FILE TEMPLATE.” Similarly, click Browse and create a folder for that project called something like “PROJECT FOLDER TEMPLATE.” Not the most clever names, but you’ll change them with each new project so it doesn't really matter! The save location isn't important at the moment. Next, think about how you want your project to act and how you want your files managed for nearly every project. Do you usually start off with GPU acceleration on? Do you often capture from an external box by Blackmagic or AJA? Adjust those settings now in the General tab. If you work independently/freelance, you probably work with default settings here, ensuring all the Scratch Disk settings are set to “Same as Project” meaning all these helper files will automatically be added to the same folder as the project file. However, if you work in a networked/shared storage environment, adjust your settings accordingly here. This one is really up to personal taste, and honestly, it’s a setting that you might need to change frequently in the middle of a project depending on your needs. But ask yourself, do I want most of my media duplicated as I import it? If so, check mark Ingest. If you’re already a very well organized editor with good media management skills, you might not want this on by default. But remember, you can change these settings at any time from the File menu. I usually leave this off by default and turn it on when I’m importing from memory cards. Annoying Premiere Behavior Alert: Rewind your brain a bit to Scratch Disk settings. When set to “Same as Project,” items like Video Previews, Auto Save, Captured Audio, etc. all automatically create dedicated folders for each of these file types. So one would assume that in Ingest Settings, if you tick “Ingest” and set Primary Destination to “Same as Project,” that it too would create a dedicated folder for copied media in a nicely organized fashion. WRONG. For some reason that I can only assume is an oversight, Adobe simply dumps ALL your imported and duplicated media into the same directory as the project file. Meaning if you create a project file and import 100 files, you’ll have a folder with 101 items in it - your project file plus 100 pieces of media, rather than a folder with the media inside. If this bugs you too, please (pretty please!) file a feature request here: http://www.adobe.com/products/wishform.html. There are ton of ways to customize the Project panel to your liking. Here are a few questions to ask yourself. Are you a fan of Icon View or List View? Do you like to show thumbnails in List View? What columns of information do you like to see in the List View? All of these can be set before any media is ever imported. Also, take into consideration how you most often organize your media. Are you always creating folders called “Sequences,” “Audio,” “Video,” “Images,” etc.? (Or perhaps slightly more specific but you get the idea). Then create those folders now so you never have to again. Some people also like to number their folders to make sure they're always in the same order or match their typical workflow. Lastly, don’t forget about Search Bins. If you’re unfamiliar, check out my previous post which covers the basics. If you want to have smart, magical bins that can automatically search your media and display things like your favorite clips or clips with certain keywords on them, you can pre-create them with Search Bins! You may have already created a favorite, customized workspace you love to use. Select it now! If not, adjust the panels just the way you like them. Are there panels you don't use often (I’m looking at you, Info and History panels!)? Close them! Remember, Premiere remembers the last workspace a project file was in when closed so this will ensure it always opens in the one you want! Normally, many of us likely create our sequences by either dragging a clip to the Timeline panel or by right clicking a clip and choosing “New Sequence from Clip.” That’s fine and dandy, it’s an easy step, but do you also find yourself renaming your audio tracks and adjusting track heights and other sequence settings? Let’s tackle that now. Go to File->New->Sequence. I won’t lie, this is one of my least favorite windows in all of Premiere. It’s a bit confusing and misleading to newer editors who aren't comfortable with codecs, formats and video properties. That’s an entire other article unto itself. But try and find a preset that most closely matches the majority of the footage you typically work with. Don’t worry about the format name (like DSLR vs AVCHD), concern yourself more with finding a setting that matches the resolution and frame rate of most of the video you work with (such as 1920x1080 and 29.97 fps (usually written as 30fps in most preset names). IF you think you need to further customize the preset, hop over to the Settings tab and make adjustments there. Do you usually have one or two tracks for VO/Narration? One for music? One for ambient? Sound Effects? You can use the Tracks panel to add as many audio tracks as you want up front and name them, rather than the less useful “Audio 1,” Audio 2,” designations. You can get much deeper here by tweaking track type and output assignments, but that’s above the scope of this article! When you’re done, hit OK! Lastly, tweak any settings in the Timeline panel such as track heights and various view settings. Making The Project File a Template Go ahead and quit Premiere. Find your project template folder and zip it (right click on either Mac or Windows). You are effectively done! From now on, when you want to create a new project merely double click the zip file to create a duplicate of your project folder, rename the resulting folder for your new project, open it, rename the project file inside, open it, and voila! You’re ready to roll! To help out, I’ve included a sample project file with common settings here. Tweak this one to match your needs and rezip the folder!